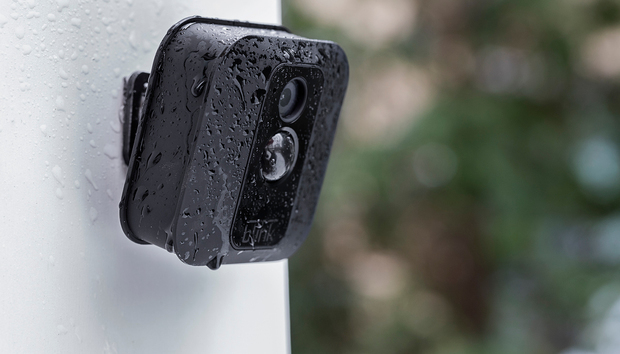 The Blink XT is an indoor/outdoor version of the popular Blink security camera. It takes the basic specs of that model, adds weatherproofing and infrared night vision, and bumps the top resolution from 720p to 1080p. The basic Blink XT system includes the camera and a sync module for $130; additional cameras can be purchased for $120 each. Two, three, and five-camera systems are also available, each with a single sync module included. The Blink XT boasts “simple installation” on the packaging, and it does not lie. The camera runs on a pair of AA lithium batteries, and you just need remove the back panel from the 3-by-3-inch square camera enclosure and pop them into the battery compartment. 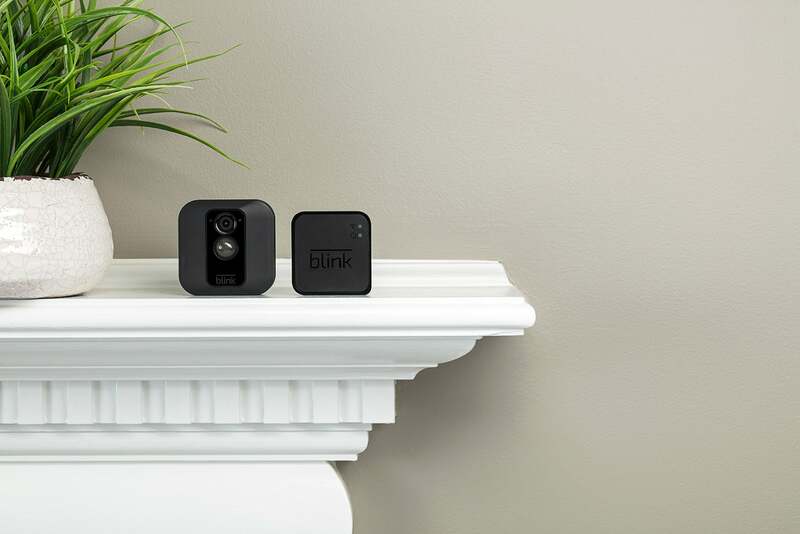 Download the Blink Home Monitor app for Android or iOS and follow the onscreen walkthrough to connect the camera and its slightly smaller sync module to your Wi-Fi network. The beauty of the XT’s small, wireless design is that you can easily move it around your home and set it down whereever you want, as long as it’s within the approximately 100-foot range of the sync module. Its dimensions allow it to sit on any flat surface without need of a stand, and it can be easily angled for the best view. The wireless Blink XT can be easily moved to where you need it. For use outside, you’ll want to mount it using the included bracket, but even this takes less than 10 minutes. The XT has an IP65 weatherproof rating—meaning it’s “dust tight” and protected from water jets from a nozzle—and it has an operating temperature of -4 degrees to 113 degrees Fahrenheit. The sync module’s operating temperature is 32 degrees to 104 degrees F, but Blink doesn’t indicate an IP rating for it, so it should be kept indoors. The XT has at 110-degree field of view, which was enough to take in my entire living room without too much fisheye distortion. A firmware update during testing seemed to transform an initially fuzzy image to a much clearer one, but the camera had a problem with bright light, whether from the sun or light bulbs, washing out portions of the image. Not surprisingly the best image quality is when I toggled up to the 1080p “enhanced” setting, but that will drain the batteries faster. The camera’s single infrared light can be adjusted to provide up to 20 feet of night vision. It did a good job generally, but had an issue bouncing off reflective surfaces such as TV screens and chrome car bumpers and back into the lens, obscuring parts of the image. The greater the light’s intensity, the greater the glare. That’s not something you want to confront when you’re trying to identify an intruder. The Blink Home Monitor app puts all camera controls a tap or two away. The camera only records video when it detects motion. You can adjust clip duration from 5- to 60 seconds in the app, though longer recording times are more of a drain on the battery. The passive-infrared detection was very accurate—it only got tripped by humans and animals—and the alerts were timely. Clicking “view” on the notification takes you to the video clip, which you can download, share, or delete from the playback screen. Video clips themselves are stored on Blink’s cloud servers. Blink doesn’t offer any subscriptions; instead, you get enough free storage for two hours of clips. Once that’s reached, clips are deleted on a first-in, first-out basis to make space. The Blink Home Monitor app seems designed with ease-of-use as a priority, as everything you need to control and manage the XT is just a finger-tap or two away. 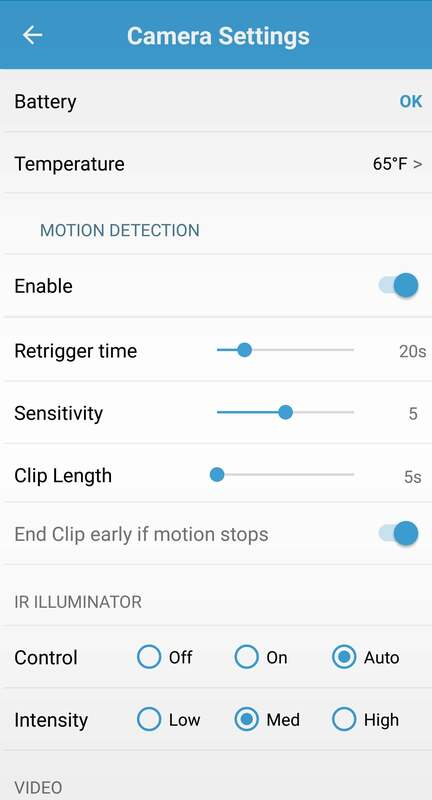 You can turn motion detection on and off, access the video clip library (called the “clip roll”), and check the connection status of the sync module all from the camera app’s home screen. The bulk of the camera controls, though, are in a settings menu that’s also accessed from the home screen. Here, you can adjust the motion detection sensitivity, change the intensity of the infrared “illuminator,” and toggle between three image quality presets. You can also set hot and cold thresholds for the camera’s temperature sensor and receive alerts when the ambient temperature falls outside this range. Integration with other smart home products is pretty limited. You can tell Alexa to arm the camera and to display the feed on your Echo Spot or Echo Show. IFTTT integration allows you to connect the Blink system with Philips Hue smart bulbs. The Blink XT’s keep-it-simple ethos means there are some common features missing. Some of these are pretty basic and sorely missed, including the ability to zoom into the image and a microphone for two-way talk. And while its image quality is OK, it does have some issues that could potentially interfere with capturing usable forensic evidence. With those caveats, we can say the Blink XT is viable option for anyone who is more concerned with convenience than cutting-edge features. Everyone else should look into some of the more robust options in our security camera guide.